Whatta ya know? 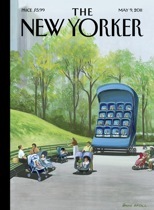 A story about New York in The New Yorker! As the day goes on, Stephen’s mind washes over his ex-wife, a prostitute, a woman he had an affair with, a woman he didn’t have an affair with, and his declining resources, as well as generally contemplating his problems: “The problem—the problem—was that he was no longer getting cast in the comic roles that had become, over years of acting in plays and, for a brief spell, on television, his strong suit.” But then he realizes that isn’t the root problem, or yes, in a way it was. But the meltdown continues—it slows briefly while Stephen interacts with a young couple and their costumed child, and the wife recognizes Stephen from television—until Alice finally renews her accusation that Stephen had an affair while Alice was in the hospital (after her suicide attempt) and then runs off. Now HE takes a couple of valium and then finds their favorite bar, where everyone else is in costume. But she joins him, they go home and he puts her to bed, where he fantasizes that he’ll get his career back on track, they’ll have a child together. So what’s it all about? Clearly, Stephen and Alice are costuming themselves, or at least Stephen is doing it for the both of them. He reflects on his costume experiences as a young actor, and he comments to the child he encounters that her lion costume makes her surprisingly—because she’s a girl—ferocious. The costumes aren’t just what they wear, I suppose—the meds are part of it, as are the lies they tell themselves. This is not a couple with a happy future. By the time I got to the end of the story, I wasn’t sure what the title referred to. But one nice thing about the Kindle is that you can run a search, and I found just one use of “he knew” in the story. It’s near the end, when Alice has again accused Stephen of having an affair: “Now he could hear and feel her terror, and he, too, began to feel frightened, because he knew here this fight could take them.” And I think that’s the point. He knows perfectly well where they’re headed, and since there’s nothing he can do about it, they might as well dress up and take their meds.